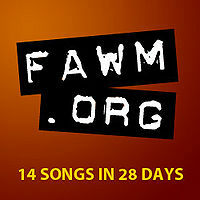 This is the sixth year that I have participated in February Album Writing Month (FAWM). Two days in I already have written two of fourteen songs – on my way to completing the challenge. You can check out the posted demos for both Lunar Groove & Mare Serenitatis on my FAWM Page. And of course, leave me a comment below & let me know what you think of these new songs. In the mean time, I’ve started work on Song # 3, tentatively tittled Spiritual Vigilante. It’s a big departure from my normal sound, being heavily influenced by the blues. Plus, it starts off with some lyrics that flashed into my head as I was leaving work this afternoon. I can say one thing for FAWM, it’s a great way to get the creative juices flowing. Stay tuned here & at my FAWM Page for the latest updates on my process & the newest tunes to be posted as part of the FAWM 2015 challenge.